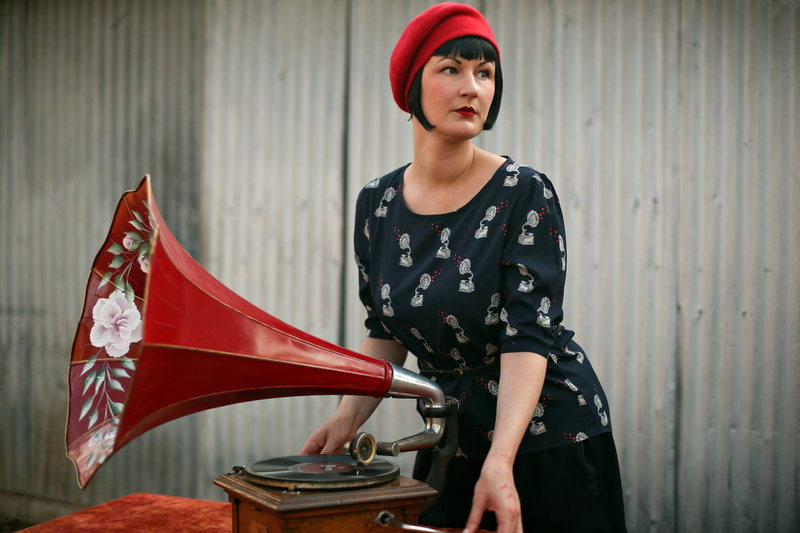 There are old-school DJs and then there's DJ Amelia Foxtrot of Austin Phonograph Co. in Texas. Her turntables are antique hand-cranked phonographs and her records are scratchy-sounding 78s. I've been doing phonograph DJ work for 7 years. I started in 2012 because I wanted to buy a phonograph. Being an entrepreneur at heart, I thought if I created a business DJing with it, my hobby would fund itself. And I got to buy two! She mostly plays private events like seances (! ), weddings, and fancy birthday parties. Though, on March 24, you can catch her at the Jazz Age Sunday Social in Dallas. Amelia also co-owns and runs Sweet Ritual, a popular dairy-free ice cream shop in Austin. Additionally, she teaches Cool School for budding vegan ice cream parlor owners. #Repost @phonographfilm ・・・ “Once & Again” Official Trailer. “Once & Again,” a documentary short about three Austin-based antique phonograph collectors, explores the human desire to connect with the music and voices of the past. This week, on the same day, I had not one but two friends tell me about designer Sonia Harris' "swearing patterns." Of course, I instantly became a fan. Her hidden-in-plain-sight patterns are subversive yet perfectly understated. Despite my desire to create and soothe myself with art, I was also very angry at the bad luck of having spent decades dealing with pain from endometriosis only to get breast cancer just as I thought there was an end to it. The disgusting effects of the treatment, the frightening and painful experiences kept on coming... Hence my patterns contained a lot of profanity. I wanted to swear and I needed to swear. If I could have, I’d have been shouting those profanities from the rooftops! But I had no strength to raise my voice or even stomp around, so that left my drawings. I could write down an exclamation of disgust, carefully and lovingly so that seeing it gave me strength, reminded me that I have a voice and I am still alive. Seeing the repetition of my words and patterns calmed me, the inherent beauty of them made me feel in harmony with life again and able to rest. 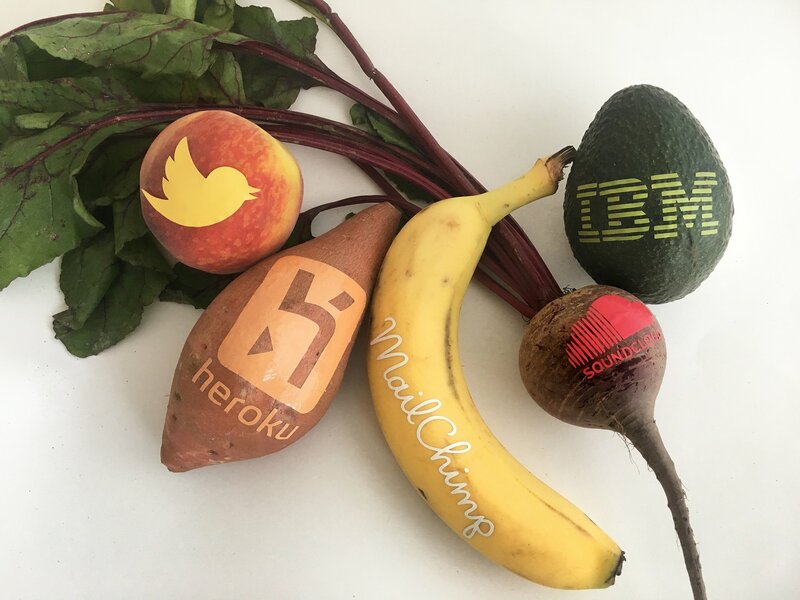 In an article published Wednesday, Fast Company revealed that logoed fruits and vegetables are a hot trend with tech companies, beating out the usual swag like stress balls or notebooks. 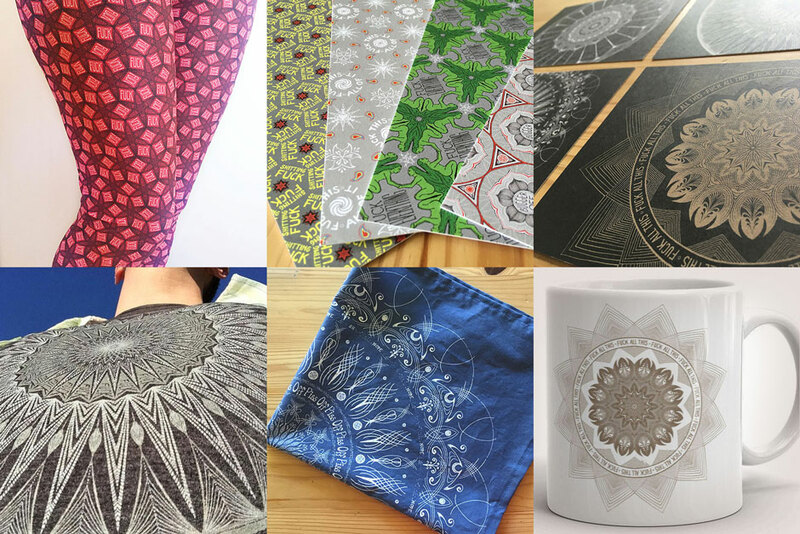 Serial artrepreneur Danielle Baskin (who you may remember from the Your Boss app or Drone Sweaters) is behind this trend. It all started in 2015 after being asked to bring some avocados to a barbecue celebrating the sale of a friend's startup. She thought it would be funny to put the startup's logo on the avocados as a joke. They were a big hit. In 2017, she started BrandedFruit.com and orders have been coming in steadily ever since. 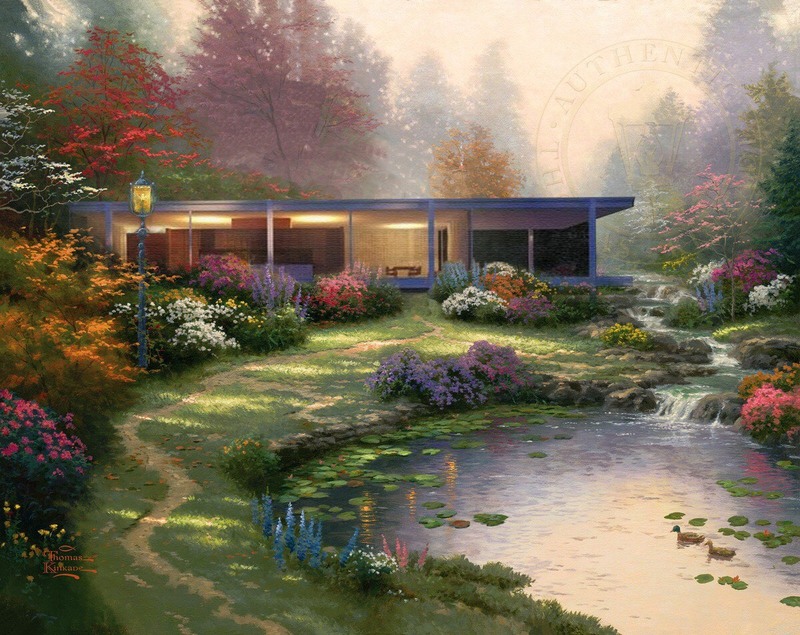 The idea for the series, which Esparza describes as “a little bit Bob Ross and a little bit Thomas Kinkade,” came to him 2012, just after he came back to Texas from a year of studying art in Italy. In Italy, nothing was built taller than a church, so it was a shock when Esparza returned to San Antonio, the size of roadside signs were particularly jarring. “I was just seeing how iconic they are, but also from the Italian perspective, how ridiculous they are. From that point of view, it’s like, ‘What are you doing, Texas? What’s going on with these big signs that you have on the side of the road? '” he says. “But the first thing I did when I got back from Italy was I went to Whataburger, and then right after that, I went to Bill Miller’s. I just needed a burger, and I needed a po’ boy. 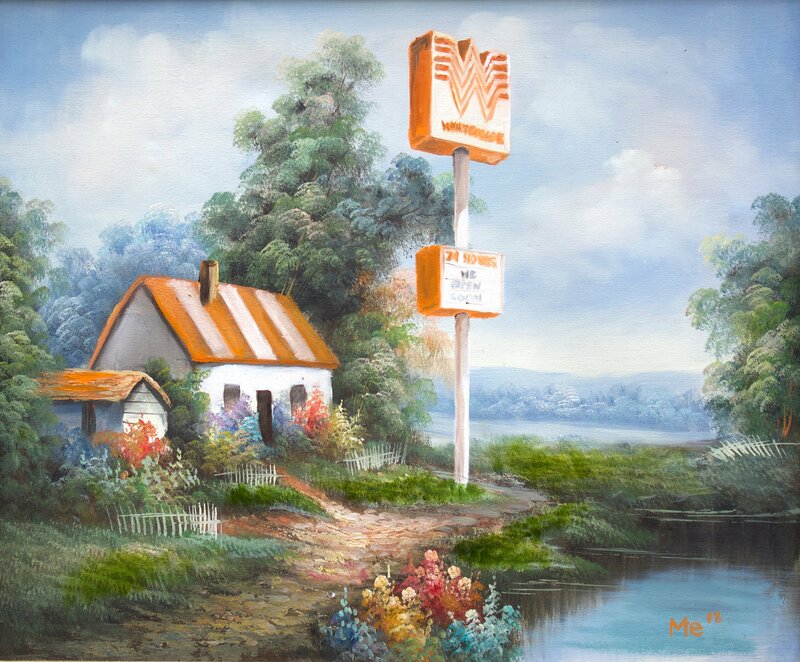 I was already full after Whataburger, but I didn’t care.” Esparza says he wants the paintings to evoke the sense of homecoming you feel when you see those signs after spending time in a place where they don’t exist—be it Italy or elsewhere. “They become your own little beacons for where you live,” he explains. 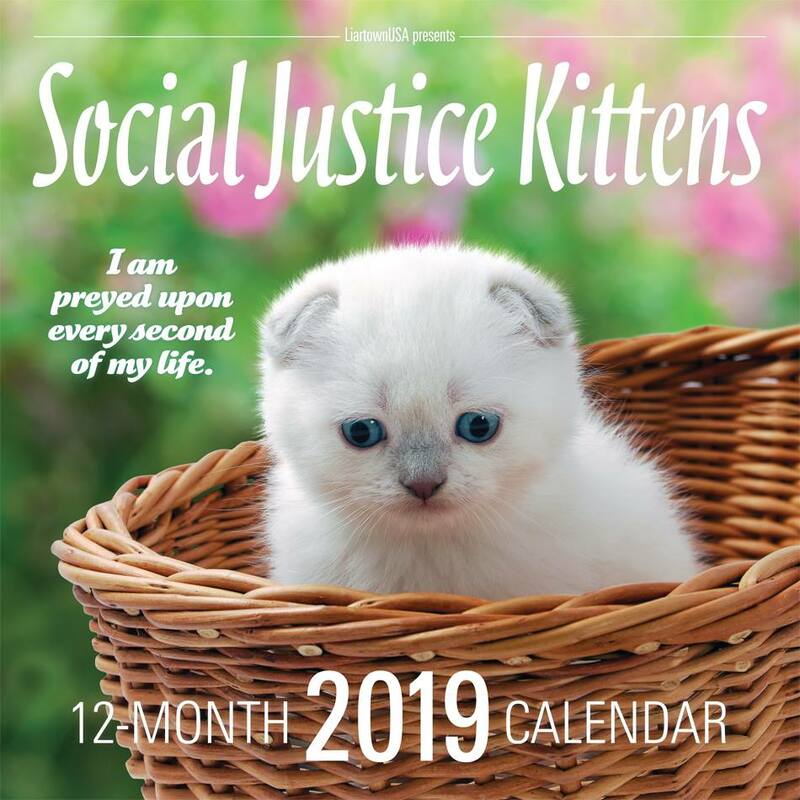 Add this to the ongoing list of "quirky and downright strange" calendars for 2019: Sean Tejaratchi of LiartownUSA's Social Justice Kittens. It’s 2019. All around us, ancient evils lurk in the deepening shadows, growing more powerful by the hour, feeding on hatred and centuries of oppression. The signs and symbols are everywhere for those willing to see. Thanks to LiarTown, you can now take the most courageous step of all: remaining silent while others speak. Once again it’s time to amplify the voices of those fluffy little activists, the Social Justice Kittens! They’ve returned, rested and ready to call out and clap back! But don’t think for a minute these woke, whiskered warriors have come alone! Get an eyeful of the all-new litter of Social Justice Puppies scrambling along behind them! These progressive pups have endured marathon struggle sessions and merciless “self-crit” to achieve dizzying levels of abject submission and self-debasement. They’re determined to be on the right side of history, and positively squirming for a chance to recite their gut-wrenching confessions! It’s up to you. Will you celebrate the voices of the marginalized, or further stain your soul with murderous complicity? Every moment you delay causes further abuse and gentrification. Those far more woke than you roll their eyes at your absurd doubts and questions! Desperate times call for desperate measures! Answer that call NOW…with kittens! Please note: As usual, every bit of kitten and puppy dialogue is sourced from genuine social media posts. Nothing has been taken out of context or misrepresented. In anticipation of the brand new Tales of the City series (!! 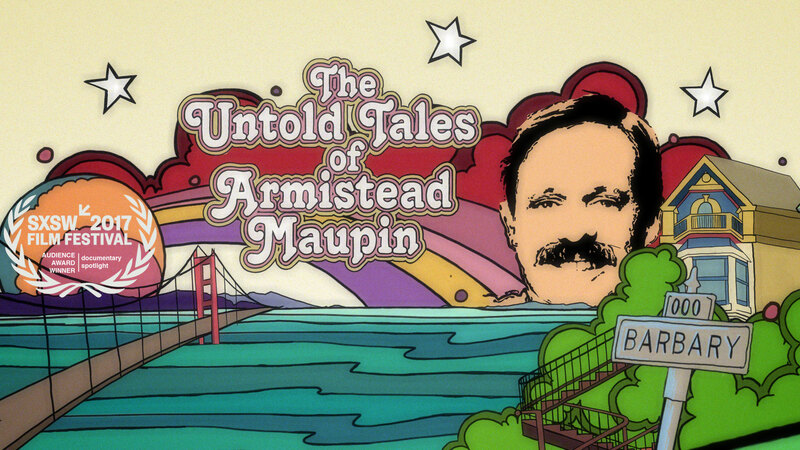 ), Netflix is now playing the documentary about its creator, The Untold Tales of Armistead Maupin. THE UNTOLD TALES OF ARMISTEAD MAUPIN examines the life and work of one of the world's most beloved storytellers, following his evolution from a conservative son of the Old South into a gay rights pioneer whose novels have inspired millions to claim their own truth. Jennifer Kroot's documentary about the creator of TALES OF THE CITY moves nimbly between playful and poignant and laugh-out-loud funny. With help from his friends (including Neil Gaiman, Laura Linney, Olympia Dukakis, Sir Ian McKellen and Amy Tan) Maupin offers a disarmingly frank look at the journey that took him from the jungles of Vietnam to the bathhouses of 70's San Francisco to the front line of the American culture war. Oh boy, I think I have a new hobby. I've just learned that you can combine puzzles, that have the same die cut, to make really awesome pieces of art. It had never occurred to me that manufacturers of mass-produced puzzles cut different puzzles of theirs in the same way, making the pieces interchangeable. It makes complete sense, of course, but my mind is still blown! I learned about the art of "puzzle montage" from one of the readers of my inbox zine, Marcia Wiley (she's the gal in Seattle who's fixing up that cool old Checker Cab). She was visiting the Bay Area and we met up for the first time this past Friday. That's when she told me about her friend Tim Klein, who makes incredible puzzle montages. I'm excited to share his work with you. In an email exchange, Tim told me that he learned about puzzle montages from the man who first made them, art professor Mel Andringa of Cedar Rapids, Iowa, "As far as I know, he and I are the only artists ever to pursue it seriously. And I think he's moved on to other things nowadays, so I may be the sole surviving practitioner." 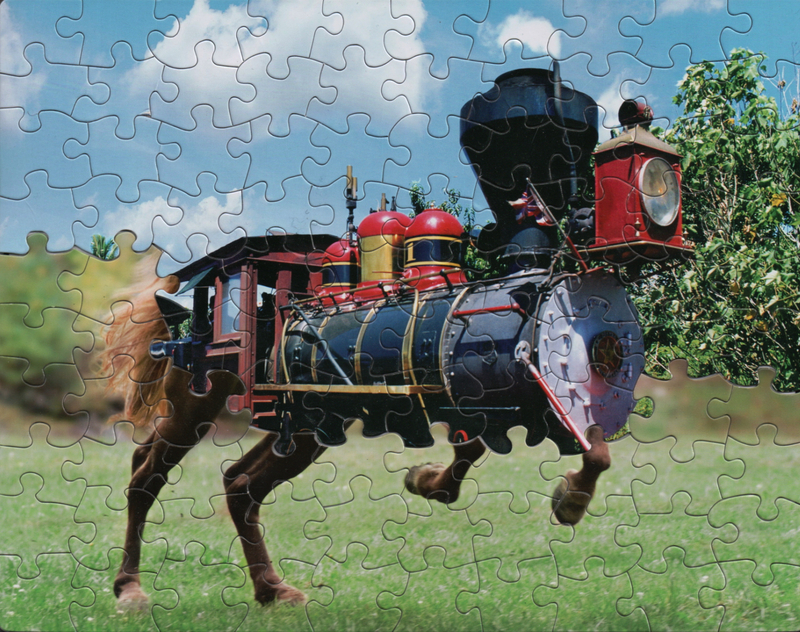 ...By selecting pieces from two or more compatible puzzles, I assemble a single "puzzle mashup" with surreal imagery that the publisher never imagined. Sometimes the results are merely chuckle-making, such as my combination of King Tut's burial mask with the front of a truck, which I call "King of the Road". I generally don't listen to podcasts. It's not that I don't want to, it's that it's difficult for me because a) I'm not good at multi-tasking (listening and writing do not go hand in hand) and b) I don't have a commute. But I do make exceptions, especially when a podcast has been recommended to me. The rotten thing, in this case, is that I can't remember who to thank for recommending Seth Godin's podcast to me. I took two trips to SoCal in the past two weeks, one by car and one by train, and got hooked on Akimbo. I listened to as much of it as I could while watching the beautiful state of California fly by me. It's about how to change culture and it's terrific. 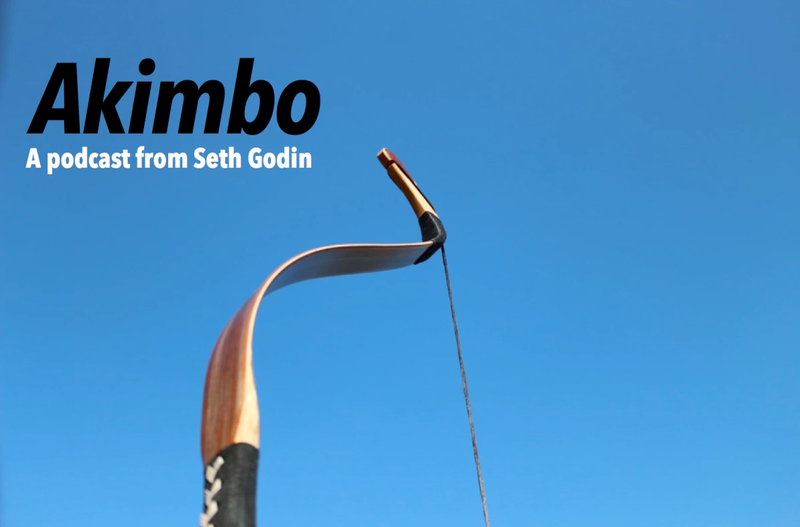 Akimbo is an ancient word, from the bend in the river or the bend in an archer's bow. It's become a symbol for strength, a posture of possibility, the idea that when we stand tall, arms bent, looking right at it, we can make a difference. Akimbo's a podcast about our culture and about how we can change it. About seeing what's happening and choosing to do something. The culture is real, but it can be changed. You can bend it. Steve Bacque, aka the Crazy Cranford Cowboy, is that Texan and he did indeed make himself an electric horse. 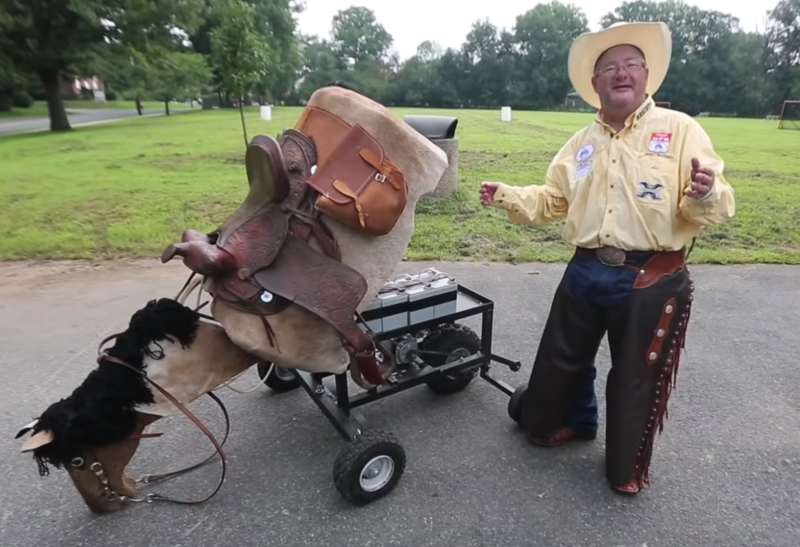 Four golf cart batteries power his not-street-legal e-horse, which he calls "Charger." Charger can do up to 40 miles per hour (though he has a governor to rein him in to about 15 miles per hour) and can handle up to 600 pounds. Charger even has a wheelie bar in the back, which is “not just for show,” Bacque warns. Yes, this motorized horse can pop a (small) wheelie. Charger turns left and right with the reins and even brakes when you pull back on them. A key turns him on, and a gas pedal sets him in motion. When Mindy Weiss Affronti pulled up to the bank drive-thru two weeks ago and saw a man atop a robotic horse at the teller window, she did a double take. Then she took his picture. After Affronti shared her photo and a video in a neighborhood Facebook group, there were others. 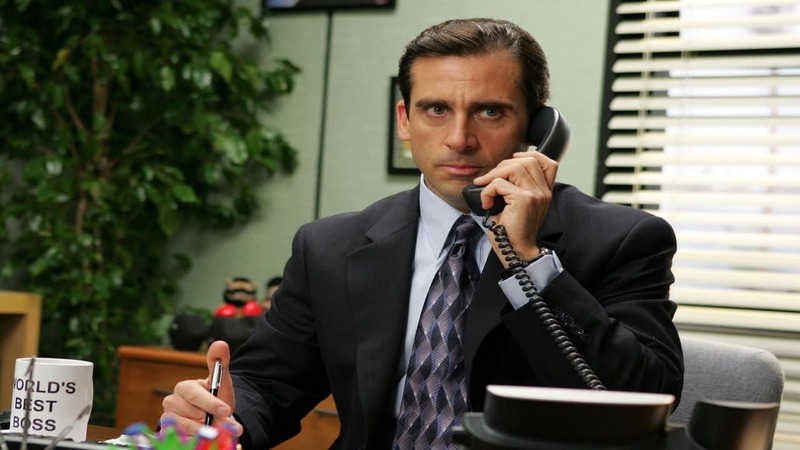 What would you say to someone if you were randomly connected to them by phone and had the opportunity to roleplay as their boss? A fun new app allows you to play the Michael Scott, Bill Lumbergh, or whatever boss of your dreams, and help them get stuff done too. Yesterday I sat down for lunch in San Francisco with Danielle Baskin, the app's co-founder. A mutual friend had recently introduced us in an email, using the subject line, "Rusty / Danielle - I can't believe you two DON'T know each other." She's got all kinds of neat irons in the fire and many of them seem to teeter on that line between art and something that is actually useful. Her latest project rides that line. It's a collaboration with programmer Max Hawkins and it started blowing up on Product Hunt this week. It's called Your Boss and she describes it as "an app that connects people working on solo projects in a call-based accountability buddy system." My co-founder and I are entrepreneurs and freelancers with many projects. We made an app to automate phone calls between us to keep ourselves on track, because we often work alone (without a boss). 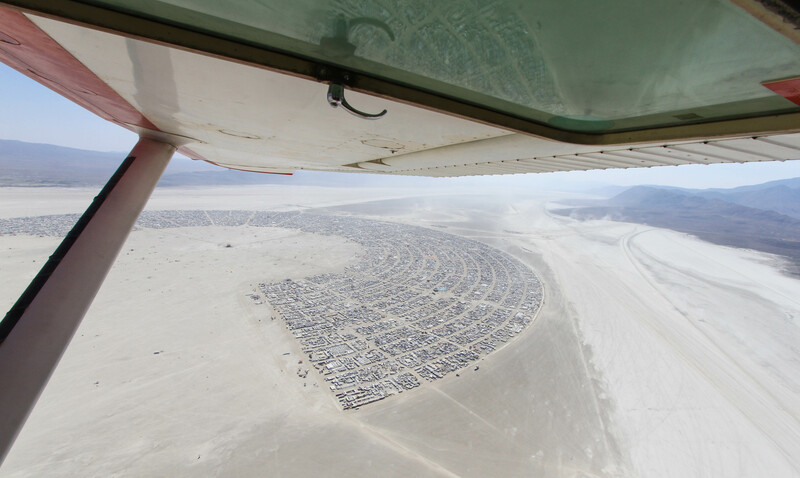 I have a long history with Burning Man, both on playa and off, but I did not know until last year that ​a small group of ​generous Burner pilots ​gift scenic flights ​-- ​at their own expense and discretion -- over Black Rock City during the event. The catch? Well, first you need to go to Burning Man, which means getting a ticket. Then, once you're out there, you have to get up real early, put your name on a list at the Black Rock City Municipal Airport and wait -- in the heat, for hours -- for your name to be called. Since the planes are small and each ride is about half an hour long, the wait to get that amazing bird's eye view can be upwards of six hours or more. I woke up late on Saturday, the morning of the Burn. It was the last day pilots were gifting these rides for 2017, so I pedaled over anyway and put my name on the list. It was 9 AM and the guy in charge warned me it would be at least six hours before I'd be airborne, if I was "lucky." The airport was a fair distance away from where I was camping, so I decided to stay put. To kill some time, I asked the airport staff if they needed a volunteer. As luck would have it, they did. 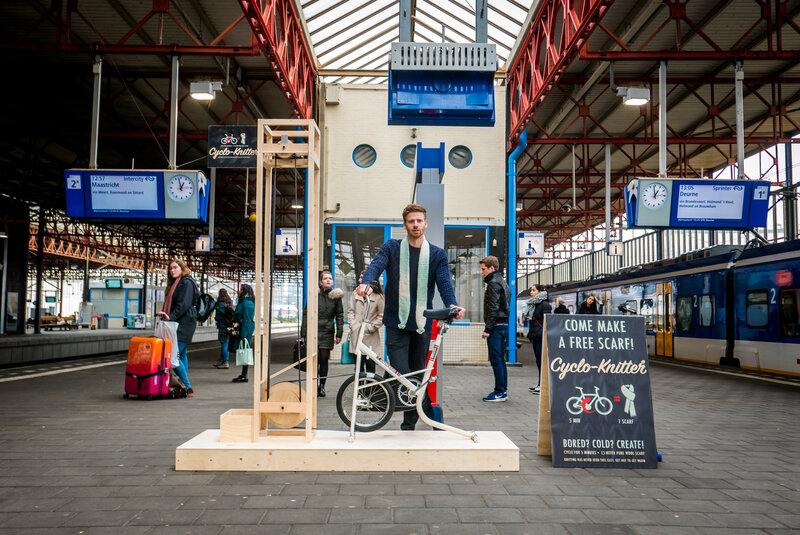 To stave off the cold and boredom of waiting at the train station, Dutch design student George Barratt-Jones made a pedal-powered knitting machine that can whip up a neck scarf in five minutes flat. He writes, "[It] gets you warm by moving, you are making something while you wait and in the end you are left with a free scarf! That you can decide to keep yourself or give to someone who needs it more." 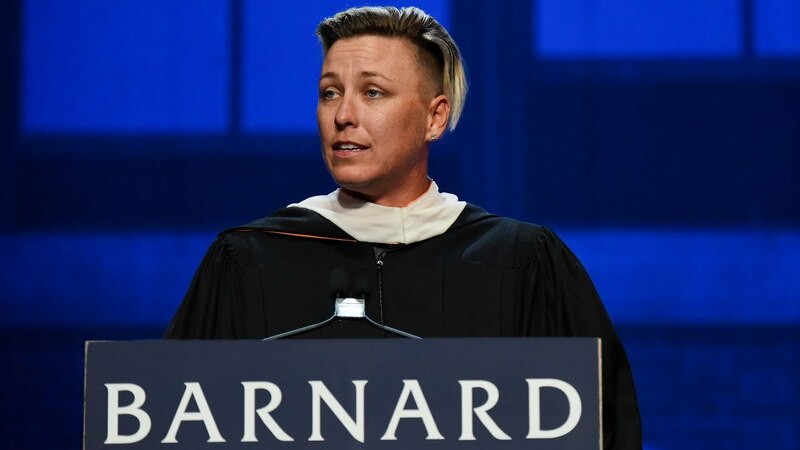 Last Wednesday, soccer champion, equal pay/LGBTQ activist, and badass extraordinaire Abby Wambach delivered the keynote for Barnard College, an all-women's liberal arts college in Manhattan. She shared with the graduating class, who she deemed the "Wolf Pack," the four rules she used to unite her own soccer team "pack," the team which went on to win Olympic gold. You might guess it was a picture of their last big win, of them standing on a podium accepting gold medals—but it wasn’t. I met Seattle artist Marcia Wiley through my inbox zine a couple months ago. I had written about the idea of the "positive deviant," basically someone who strays from the norm but brings value rather than pain (akin to the "happy mutant"). The concept really resonated with me and I asked readers to send along names of positive deviants who they were aware of because I wanted to start a list. Marcia rightly offered up her own name, and, in our most recent communication, she shared a project of hers with me: "Miss Direction's Ride Service." Since 2005, she has been bringing unexpected delight to strangers in a really fun way. Dressed in her alter ego "Miss Direction" driving outfit (below), she gives people waiting at bus stops a free ride to their destination in her Honda SUV. In exchange for the complimentary pickup, passengers share their story with her. It's been a great success. Now she's looking to start "Miss Direction's Checker Cab Service." 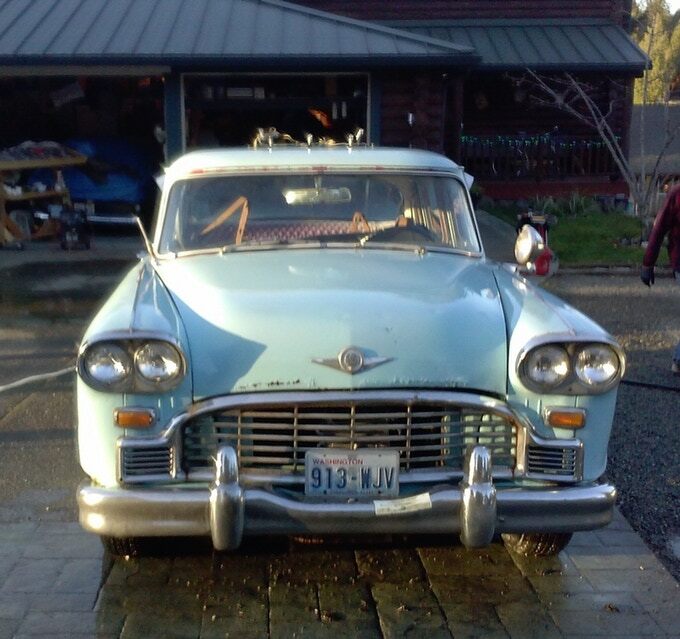 A 1967 Checker Cab has already surfaced for the job, but it needs some restoration work before she can take it to the streets. So, she's started a Kickstarter campaign to fund her dream of bringing "everyday magic" to Seattle, a place, she writes, "that is changing so rapidly that people often feel a loss of connection and have a sense that the city is losing its soul and becoming less unique." I'm committed to having Miss Direction’s ’67 Marathon Checker Cab on the road by November 11, 2018.